The Vivanta by Taj – Blue Diamond Hotel is a legend in its own right. An accredited 5-star hotel; there are 110 rooms, 5 dining options, and plenty of facilities that offer rest and relaxation to all guests. What we love most is that they have a coffee shop that is open all day! 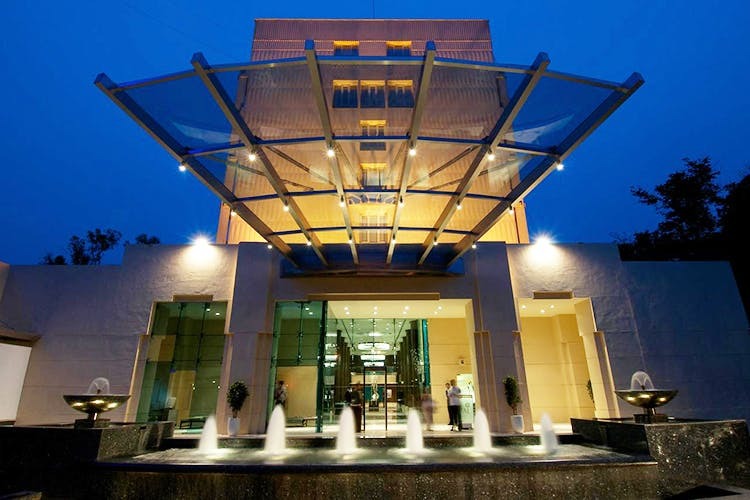 One of the oldest 5-star Hotels in Pune – the Blue Diamond Hotel was re-branded under the Vivanta chain (also belonging to the Tatas) and is now known as the ‘Vivanta by Taj – Blue Diamond Hotel’. The hotel is in the process of receiving a contemporary design makeover, but still retains some of its old-school charm. There are rooms here offer cosy, comfortable accommodation – with air-conditioning, workspaces, a well-stocked minibar with tea/coffee making facilities, a flat-screen TV and home theatre system, a bathtub, plush bathrobes, and even a pillow menu! The hotel is pet-friendly, so you can bring along your fur-baby (on prior notice) at an extra charge. Other facilities include a swimming pool, fitness centre, an in-house spa and more. We love their 24-hour multi-cuisine ‘Coffee Shop’ (now called ‘Latitude’) which serves everything from poori bhaji and thalipeeth; to prawn cocktail, smoked salmon-topped pizza, and banoffee pie. If you’ve just partied the night away and need a quiet stop with your friends before heading home, this is just where you should be headed. Apart from that, their other restaurant, Whispering Bamboo is popular for their Chinese and Thai fine-dining, and the Indian-specialty restaurant Mystic Masala serves is reportedly the ‘only 5-star restaurant offering Maharashtrian Peshwai cuisine in the city’. For a more relaxed evening of post-work drinks and substantial snacks, check out the ‘Easy Bar’; and for a sweet indulgence, check out their Deli section – aptly named ‘Caramel’. The hotel may be small, but what they lack in size is made up for by the quality of service and hospitality offered here. The lobby and most public spaces have already been revamped, but further ongoing renovations of the rooms also promise a modern makeover to suit the times. It’s a 5-star hotel, so keep in mind that staying here won’t come cheap. It’s very well connected to the buzzing entertainment district of Koregaon Park, plenty of museums, and is only 5km from the airport, and 4km from the railway station.